VANCOUVER, BC, January 18, 2012. Mirasol Resources Ltd. (TSX-V: MRZ, Frankfurt: M8R) (“Mirasol”) announces that it has commenced a new season of diamond drilling at its 100%-owned Virginia Silver Project, Santa Cruz Province, Argentina. This program comprises the Fourth Phase of drilling at Virginia and will include a minimum of 5,000 metres of diamond core drilling. Phase 3 drilling was completed in late December 2011 and comprised over 5,900 metres in 55 core holes, raising the total drilled at Virginia to over 15,300 meters in 172 holes (Figure 1). Phase 3 drilling was focused to test new veins and to expand the project’s potential for discovery of additional shallow oxide silver deposits, principally in the areas where successful scout holes were drilled during Phase 2 (news release October 27, 2011). Assays remain pending from a number of samples which will be reported on completion of quality control analysis. Initial Phase 4 drilling is designed to further test extensions of four silver deposits, the Julia North, Central and South veins and the Naty Vein, defined by Phases 1 and 2 drilling. Extensions of these veins will be tested along strike and down dip. Phase 4 drilling may return to the Martina and Ely veins which have shown promising visual indications in the Phase 3 drill holes. In parallel with Phase 4 drilling, a program of surface prospecting, sampling and trenching will be undertaken concurrently to explore the large prospective area indicated by IP gradient array geophysics and ground magnetics, and preliminary surface reconnaissance. Mirasol’s in-house geophysical team has further extended gradient array IP coverage (Figure 1). The surface exploration program is designed to identify and prioritize additional targets for drilling in late 2012. 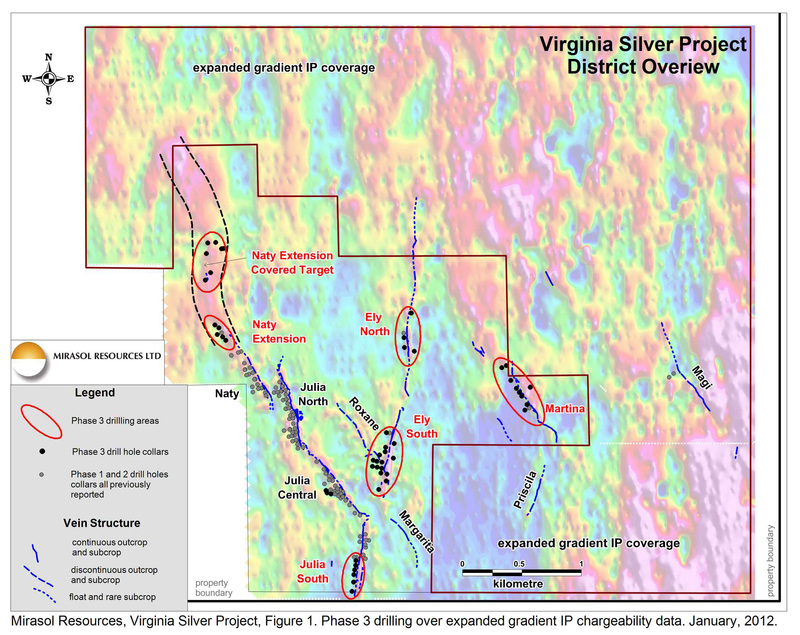 Mirasol has rapidly advanced exploration of the Virginia Silver District from a prospecting discovery to drill definition of four silver deposits within the first year of drilling, and which shows potential for significant additional discoveries. Mirasol believes that the geometry, the silver grades and deeply oxidized character of the silver mineralization commencing at surface are unique and positive characteristics for potential bulk-mineable development. Exploration at Mirasol’s Projects is supervised by Stephen C. Nano, Vice President of Exploration; Timothy Heenan, Exploration Manager; and Paul Lhotka, Principal Geologist who is the Qualified Person under NI 43-101. All technical information for the Company’s projects is obtained and reported under a formal quality assurance and quality control (QA/QC) program. Drill core, rock chip and stream sediment samples are collected under the supervision of Company geologists in accordance with standard industry practice. Samples are dispatched via commercial transport to an ISO 9001:2000-accredited laboratory in Argentina for analysis. Results are routinely examined by an independent geochemist to ensure laboratory performance meets required standards.